Some years ago, Jill Hamilton had an epiphany while driving on a stretch of highway in North Carolina. As was her custom, she had turned off the radio to think, this time about a nursing project built around spirituality and how religious songs are used in the African American community. "You can do this," the nurse researcher thought to herself. "You know the methods. You know how to interview. You know how to analyze the data. You can do this." The interviews continue to be a source of study and inspiration for Hamilton, who rejoined Emory's School of Nursing last year. Included in a research presentation for her BSN students is a photo of the small, white-clapboard church she attended as a girl in Black Mountain, North Carolina. Many of her study participants grew up similarly, listening to songs, psalms, and prayers learned in church and school or at home from beloved family members. As Hamilton has documented, these songs and verses provide comfort to older African Americans in times of stress, especially during illness. 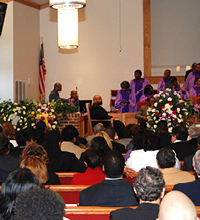 Hamilton first witnessed the healing power of religious song at a funeral in eastern North Carolina. When members of the congregation were invited to speak, an older African American gentleman went to the microphone and began to sing. "Many people memorize songs when growing up but forget about them until something happens that shakes them," says Hamilton, who was a Georgia Cancer Coalition Distinguished Scholar during her first tenure at Emory. "When you're growing up, you're happy, and everything is fine. Then later on in adulthood, someone tells you, 'you've got cancer.' And you think, 'Cancer means I'm going to die.' Cancer patients have told me, 'Once I got myself together, I remembered this song my grandmamma or granddaddy sang to me.' "
"I'd never heard that particular song before," Hamilton recalls. "He sang it as a source of comfort to the family. I put on my research hat in the back of that church. I knew I had to capture these songs before they died off with the older generation." Colleagues were skeptical of her idea at first. Why should a nurse study religious songs? Still, Hamilton held fast to her idea, guided by her epiphany in the car, and eventually published her findings in journals such as The Gerontologist (2012), Nursing Research (2013), and Cancer Nursing (2016 and 2017). The consumer magazine Good Housekeeping also featured her work. 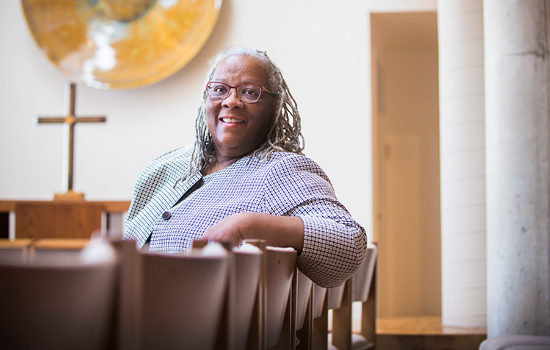 While the link between religion and mental health is well established, Hamilton's studies are the first to focus specifically on religious songs and African American cancer survivors. Early on, when she showed some of her video interviews to a group of breast cancer survivors, they told her, "We need this." "This is not about music therapy," Hamilton emphasizes. "Religious songs transport people. They take you from a situation where you are stressed or sad back to a place where you felt safe and loved." In an article published in Cancer Nursing this year, Hamilton notes that African Americans may view cancer as a punishment from God and a death sentence. Statistics support the latter; 50 years ago, African Americans had an overall five-year cancer survival rate of 27 percent. Today, their overall five-year survival rate is 62 percent. More and more, African Americans successfully complete their cancer treatment despite the negative perceptions they may hold. "Spirituality and religious beliefs were complementary strategies to treatment that enabled these participants to overcome their fears and anxieties, to endure treatment, and to find meaning and purpose in their illness experience," Hamilton writes. Although their survival rates have greatly improved, African Americans continue to have a higher burden of cancer, the result of disparities such as low income, limited health care access, less than optimal treatment delivery, and lower rates of health literacy. "So, what are we missing from this group?" the author asks in her article. Hamilton offers an idea. When their patients seem anxious or depressed, oncology nurses should ask them about their favorite song or Bible verse. "If they tell you about a song or verse that might be helpful, note it in their chart, and when they get stressed out, can't sleep, or are in severe pain, help them recall the words," says Hamilton. "You can use this strategy for anyone. The nurse can write some of the words on the board in the patient's room." But what if a nurse feels uncomfortable talking about religion or faith? "You can acknowledge their beliefs, even if you don't share them," Hamilton suggests. "That makes them feel valued, that makes them trust you. And if they trust you, then you can engage them more in their health care." Hamilton plans to pilot a new study involving African Americans with late-stage cancer at Atlanta's Grady Memorial Hospital. She will show them some of the video interviews she's collected to determine if the stories and songs help relieve their psychological distress. As intended, her video subjects come from a range of socioeconomic backgrounds. "If you show people a video of others like them who survived cancer, viewers will think, 'I can survive too.' "
Long term, Hamilton would like to turn the videos into a DVD to share with faith-based institutions and community groups. These videos also could serve as a valuable training tool for health care providers and nursing, social work, public health, and pharmacy students. "We need these stories," she says, "because they represent a legacy of sustainability and hope."